One of my favorite places to run is Cochran Shoals. (Commonly called “The River”.) This is a beautiful 5k loop that follows the Chattahoochee river. It is wide, well marked and scenic. There are two parking areas, one off of Interstate Parkway North on the south side of the park and another off of Columns Drive on the north side. I highly recommend parking in the south lot as the 5k markers start there. This is a highly popular park and on a sunny Saturday you may have to wait in line to get a parking spot. In addition, there is a parking fee of $3.00 – I recommend buying the yearly pass for $25.00 – you will definitely want to come back. Here you can see the full 5k loop starting in the south parking lot. The markers have you following the Chattahoochee river for the first 1.5 miles. The entire trail is flat and easy – a great place to throw down a 5k PR. On the back side of the trail, you are running on a well groomed trail through a marsh. On a hot summer day, this can get humid. Make note of the side trails you will pass to the right. 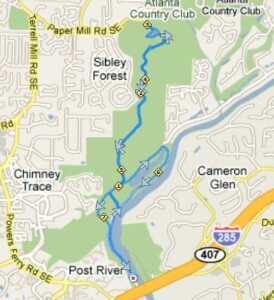 These trails will take you to the Sope Creek section of the park. In addition, there are three water fountains along this trail – one in the middle (around .5 miles), one at the north lot and another at the south lot. If you want a nice, long distance run, try heading up to the Sope Creek area of the park. Once you turn off the well groomed 5k loop, you will hit some decent hills. Watch out for bikes on this wooded trail section. Also, make sure to keep an eye out for roots and rocks. There are markers at the turns here and if you stay on the main path, the hills are easier. Once you get to the Sope Creek entrance, you will see a beautiful small lake / pond area and also find a water stop and restroom. Adding this section to the 5k loop will give you a total of about 7.5 miles. The 5k loop at Cochran Shoals will give you a nice, flat cool-down run after those hills. Here are the official park maps – the full park is broken into three sections based on the entrance – Interstate North section, Columns Drive section and Sope Creek section. If you find this post useful – please drop me a note. I would love to hear your feedback! Go to second traffic light and go left onto New Northside Drive. Use “through” lane to pick up Interstate North Parkway. Unit will be .8 miles on the right after crossing the Chattahoochee. Right on New Northside Drive. Very cool site. I will get you some maps for Boundary Waters out her in Douglasville. Hey thanks for these maps. 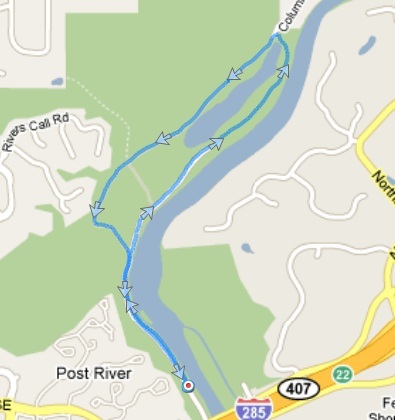 I ran the Sope Creek portion today. It was lots of up and down and a fair bit of mud — good fun!